To donate by mail, you will need to print a donation form from the website to mail in along with your donation. Josette B. Grossberg, M.D., wed to Sidney E. Grossberg, M.D., for 58 years, and mother to Daniel Eliot and Leslie David, died of an intracranial hemorrhage August 22. She was 88. Sole child of Marguerite and René Brugerolle of La Rochelle, France, she earned her medical degree and diploma in anesthesiology from the University of Paris in 1954, then joined the staff of the City Hospital of Strasbourg and subsequently that of the St. Joseph Hospital in Valence. 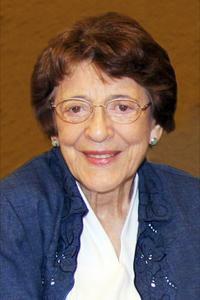 In 1958 she furthered her expertise at Duke University Hospital, where she met her husband-to-be. Selected for a fellowship as a Scholar of the British Medical Council, she attended the Postgraduate Medical School at Hammersmith Hospital, London, to qualify for the Royal College of Surgeons of England, but left after a year to return to the United States to marry Sidney. As an anesthesiologist, she considered it her obligation to minister to hospitalized patients, and did so skillfully in each city as she moved over the years with her academic husband, from Minneapolis to Manhattan to Milwaukee, while devotedly caring for her family. In 1966 Dr. Grossberg joined the staffs of the Milwaukee County General Hospital and the Marquette University School of Medicine (now the Medical College of Wisconsin) as an adjunct clinical faculty member. Later, she joined the staffs of Mount Sinai Medical Center and Lutheran Hospital/Good Samaritan Medical Center. She was a diplomate of the American Board of Anesthesiology and a member of the American Society of Anesthesiology and the International Research Society of Anesthesiology. Retiring from anesthesia practice in 1992, she undertook a new career, providing medical care and counseling for drug dependency at DePaul Rehabilitation Center until it closed in 1997. A broadly educated, cultured, and kind lady of great warmth, intelligence, and beauty, Josette was a delight to all who came to know her. Age diminished not her compassion, joyful spirit, flair, or lovely French accent. Her sudden passing is a loss come all too soon. In addition to her husband, she is survived by her son Leslie and daughter-in-law Judy Kingsbury. No formal funeral service will be held. Memorial contributions to the Medical College of Wisconsin, the Milwaukee Symphony, Hadassah, or Saint John's on the Lake would be appreciated.